What is mindful eating? The approach brings techniques taught in yoga and meditation to the dinner table. And experts say its benefits are endless. WASHINGTON — Do you remember yesterday’s lunch — the smells, tastes and textures of the turkey hoagie that you just had to have? Or were you paying more attention to your inbox — eyes fixed to the screen, firing off emails with no regard for the sandwich that was hastily chewed up and swallowed between gulps of iced coffee? If you’re like most Americans, your lunch (and breakfast and dinner) experience probably falls in line with the latter. But a growing number of wellness professionals say adding a little mindfulness to mealtime can result in some serious health benefits. Similar to mindful meditation, focusing on the breath and tapping into the present moment are the fundamentals of mindful eating. The major difference is they’re exercised at the table, not on a mat or in a studio. If that explanation sounds simple enough, Ryan says you’re right. Mindful eating is natural and uncomplicated, free from the portioning and carb-counting practices that have taken over modern society’s approach to food. By encouraging the eater to slow down and savor each bite, mindful eating focuses on the pleasures associated with food, not the rules or the guilt. Plus, it connects the mind and the mouth, making the body more aware that it’s being nourished (and thus more aware when it’s full). Research shows that those who eat mindfully tend to gravitate toward more natural, whole foods over their processed counterparts. They also tend to eat less and have a better relationship with food. Ever wonder how Jennifer Aniston got her perfectly sculpted arms and lean figure? Two words: Mandy Ingber. Several studies show that mindful eating may even be a successful treatment for binge-eating disorders and weight loss, Harvard Medical School reports. So then what’s the catch? Well, carving time out of your day and cutting out distractions to fully experience food isn’t always realistic. And chances are, that takeout will get scarfed down in front of Netflix. When it’s time to eat, shut down the email, turn off the TV and put the phone on silent. Your focus should be on the food and all five senses should be plugged into your plate. Dedicate time to your meal — both in terms of preparation and consumption. Savor each bite. There’s no need to shovel your salmon in at record pace. The slower you eat, the better, and focusing on your breath is one way to moderate your intake. “The first thing I tell everyone to do is just breathe. A lot of the time, we’re not breathing deeply,” Ryan said. Resting the fork on the plate after each bite is one way to remind yourself to do this. “That allows you to take time to breathe and be mindful. Pick it up if you’re hungry or don’t pick it up if you’re really not,” Ryan added. Chew each bite 15 to 30 times and only eat until you’re about 80 percent full — not stuffed. Mindful eating is all about feeding your body what it wants. If that’s a piece of chocolate, go for it. A cheeseburger? It’s allowed. That being said, the practice is also about balance. Ryan says if you’re out to dinner and want to order a glass of wine and a dessert, do so, but opt for a healthier entree. Plus, if you’re taking a break between each bite of your brownie sundae, you may not feel the need to finish the entire thing. Saving the best for last is another tip of Ryan’s. For example, if you’re at a cookout and your favorite item on the spread is potato salad, eat that after you eat the other things on your plate. 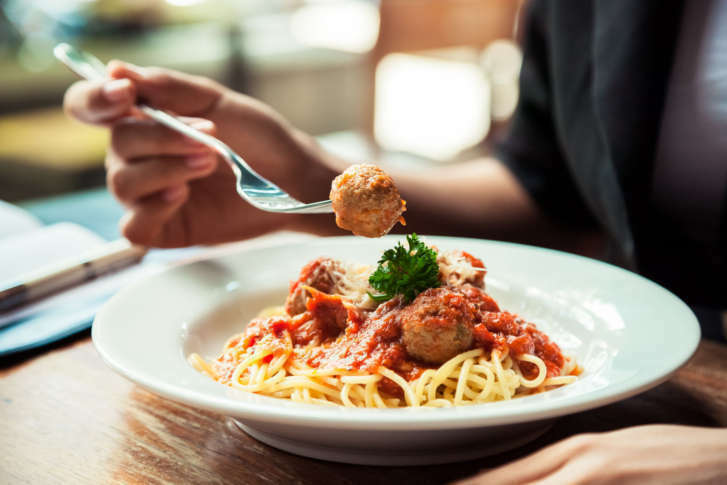 Ending your meal on a flavor you love may keep you from snacking on other foods, “because you want to keep that taste, you want to keep that good feeling,” Ryan said. It also helps to make your meal experience a positive one. Lisa Consiglio Ryan will lead a mindful eating workshop and cooking demonstration on Wednesday, June 21 at 6:30 p.m. at Take Five Meditation in Dupont Circle. For details and sign-up information, visit Take Five’s website.